A wood fuelled stove is one of the most sustainable methods of cooking there is, especially when the fuel comes from the 50 acres of trees up the back of the property. There’s enough fuel up there that’s just been blown over by the storms since we moved here to run the stove for the next five or six winters. Our stove is an Australian made Gourmet Cooker and much heavier than most similar stoves. We’re sure it will well and truly outlast us. It not only heats the house, but bakes, boils, woks and boosts the solar hot water in winter. 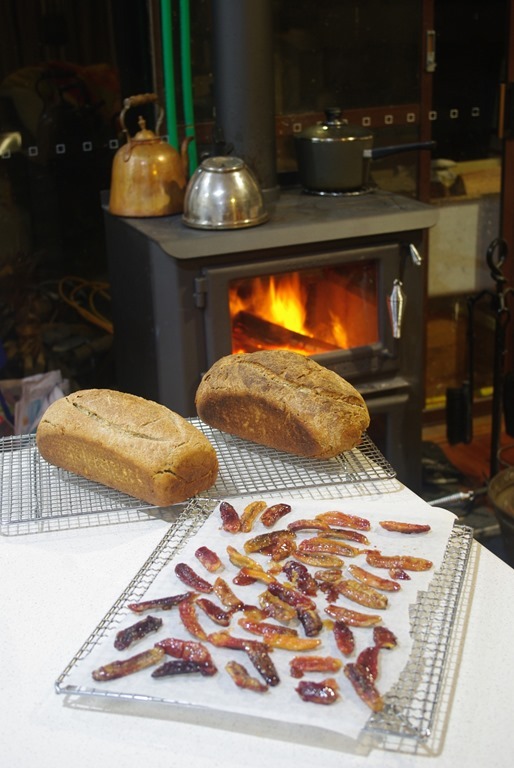 In the foreground are a couple of loaves of Annette’s awesome sourdough bread as well a tray of her experimental caramelised bananas with orange.